Why use Smart Services (Pty) Ltd? Having accumalated a wealth of technical experience over many years, our aim is not just to restore building surfaces, but to actually add value to the Clients property - we are not quick-fix contractors. This is why, with more than 30 Years experience, we are renowned for providing above-average satisfaction at reasonable prices. Painting can be a hazardous job, whether it be working off ladders or scaffolding or dealing with solvents and dust. Hiring Smart Services (Pty) Ltd will ensure you don't have to deal with these problems. Ensuring all surfaces are prepared with the correct care is of the utmost importance to ensure a longer lasting job. The choices today are more complicated than just oil, solvent or latex based paints. We know what works the best for each application and will have the right tools for the job. Hiring us means you dont have to deal with paint residues and other left overs, we are skilled knowing how to deal with hazardous waste that may be part of the job. Smart Services (Pty) Ltd will provide all clients with a written contract on presentation of each quote, this contract will clearly state the scope of work to be performed. It will also cover items such as surfaces to be painted, methods and extent of surface preparation, time schedules for the project and payment procedures. Knowing the total scope of work enables you to carefully evaluate the different quotations you may receive. With the proper information this ensures greater protection for both parties. We are well educated on the many different aspects of any painting job and our vast experience and knowledge helps eliminate any hidden surprises that may arise. Excellence in paint application is as important with your selection of a contractor, as are their skills to properly manage their business and your project. 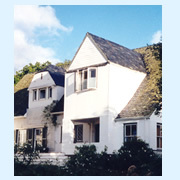 - Paint your new and existing homes. 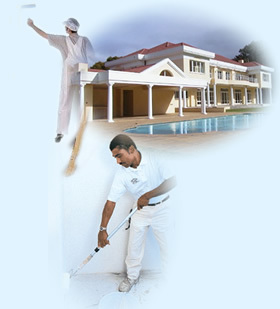 -Painting done to commercial and industrial buildings. - High pressure wash and paint your roof or install new roof sheeting. - We apply specialised textured and decorative coatings. - We coat floors with epoxies. - Restoration work done to flood and remove damp. View our gallery, including before and after pictures. We include references from our valued customers. All work done is by trained staff, and under strict supervision. 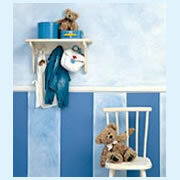 We paint houses throughout the Western Cape, and have many houses to view in our painting galley section. Learn more about painting techniques that we use. Use our online paint calculator to chose your paint colour. 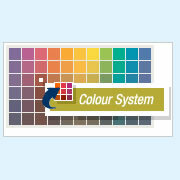 Select the interior or exterior image of your choice from a variety of colours that are available on our on line paint chart. Help given on a variety of topics and questions. Glossary: Looking for a meaning to a particuar word or termonology.